« A Mighty Abyss of Liquid Fire! That “mark,” however, has not been a physical one for a long time, and over the years there has been some occasional confusion about exactly where he lived, with references to the Strong House (now the Amherst Historical Society) next to the Jones Library as well as to a building in the block called “Phoenix Row.” The latter address is correct, and the researcher’s inquiry seemed like a good opportunity to assemble information about Webster’s house — his “humble cottage in the country”— in one place. 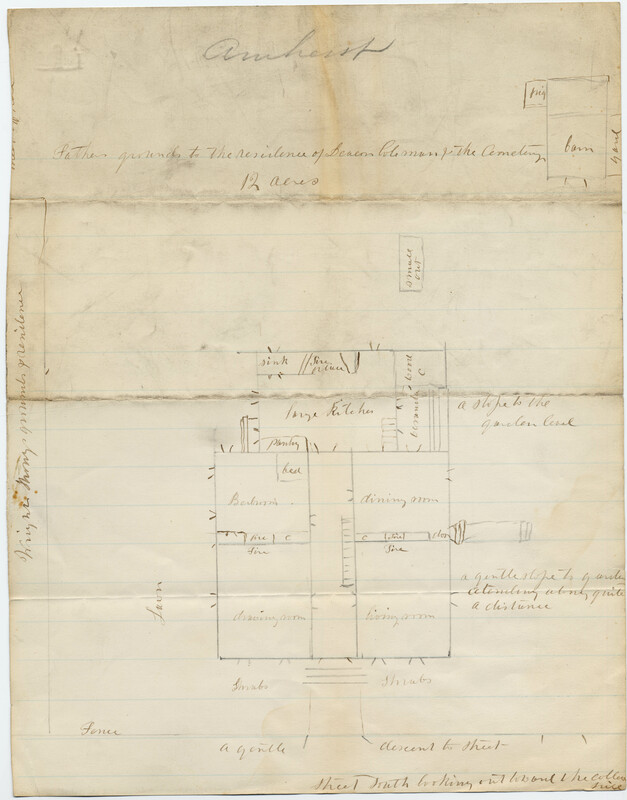 A search in the Noah Webster Family Papers at Amherst College turned up a floor plan of the Webster house by one of Webster’s daughters. The plan confirms that Webster had 12 acres, some of which he purchased after he moved here. It must’ve been idyllic. Webster’s garden flowed out the back of the house to the north and toward the prominence where the short-lived Mt. Pleasant Classical Institute would soon be, and from his second-story study window in the front southeast corner of the house (above the living room), he could see the First Congregational Church (at that time near the site of our Woods Cabinet and Observatory) and much of what then constituted the town (some 25-30 houses in the immediate area) and the cow-grazed common. 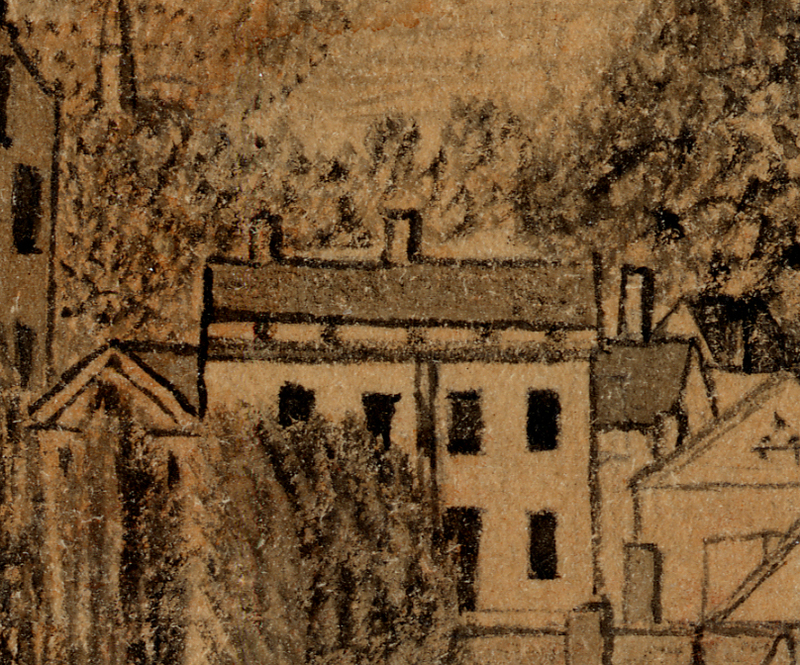 A little more searching then turned up an 1834 “sepia sketch” of the town by Mortimer Blake, AC Class of 1835, donated to the College in 1912 by Blake’s son Percy. The drawing was reproduced in a 1917 article in the Amherst Graduates Quarterly, but the quality was poor. A modern digital scan of the image provides a rare detailed view of the town early in the nineteenth century. According to a letter from Percy Blake that accompanied the donation, Mortimer Blake drew the scene from his room in “Old North College,” about where Williston Hall now stands. The perspective is complicated and many of the buildings in the center of town are difficult to distinguish, but in the accompanying detail from the image I’ve indicated which house is likely to have been Webster’s (judging by the four windows across the front of the house) as well as what must have been his orchard. Hezekiah Wright Strong’s property — gambrel-roofed house and store — is to the left (west) of the Webster property. 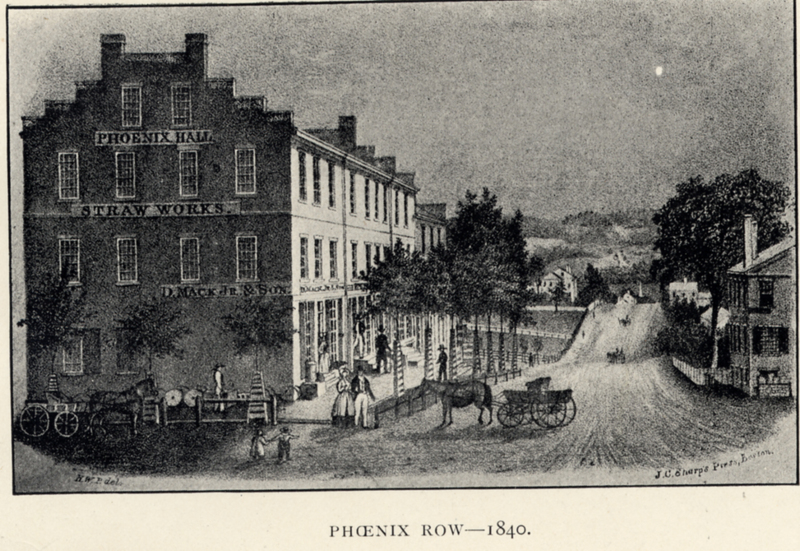 This 1840 view of Phoenix Row — two years after the fire — shows neighbor Hezekiah Wright Strong’s building and a space after it, where the Webster house had been. Webster’s garden and orchard behind the house were succeeded by, among other things, a popular eatery called the “College Candy Kitchen” and, more recently, a parking lot — the price of progress. Perhaps somewhere in the lot a lonely West Hartford grapevine still grows, last heir to the Webster farm. Webster’s diary records “July 2. 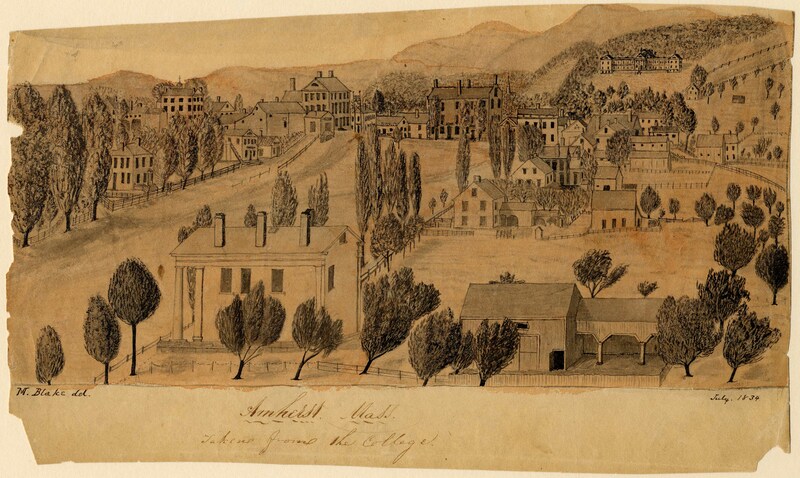 1812 I sold my house in New Haven, & on the 13th purchased a house & six acres of land in Amherst, Massachusetts. 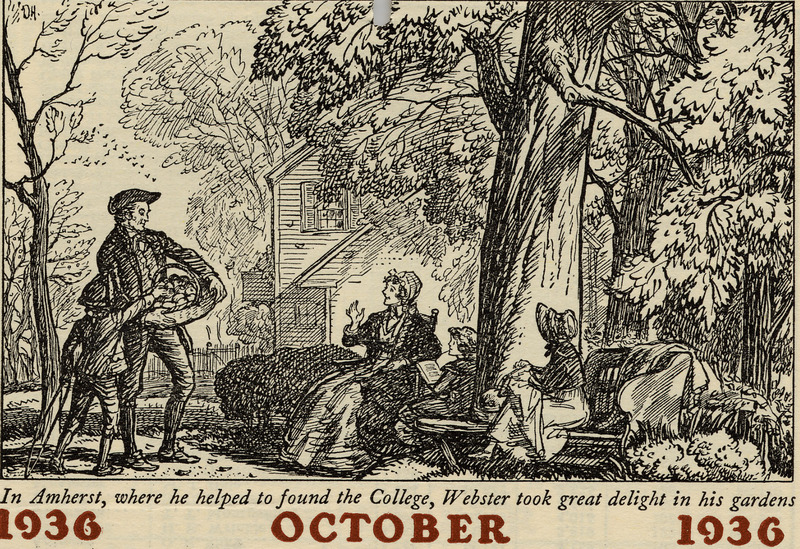 … I removed the first week in September.” He bought the Amherst property from Oliver Dickinson, and on the same day as the purchase, 13th July 1812, he mortgaged the property back to Dickinson, to secure a loan of three thousand dollars. 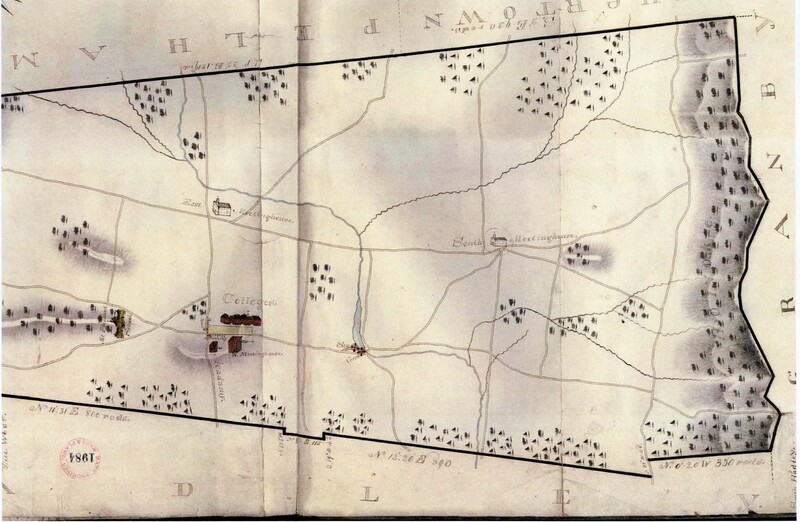 The property was described in the mortgage deed as “a certain Tract of Land in Amherst bounded and described as follows, to wit, North on Land owned by H.W.Strong & Solomon Strong, West on the Highway leading from Amherst to Sunderland, & Land of said H.W.Strong, South on the Highway leading from Amherst to Pelham, and Land of said H.W.Strong, and East on Land of Luke Montague, containing six acres more or less together with all buildings standing thereon, it being the same tract of Land which I this day purchased of said Oliver.” The deed was witnessed by Ransom Dickinson and H[ezekiah] Wright Strong.